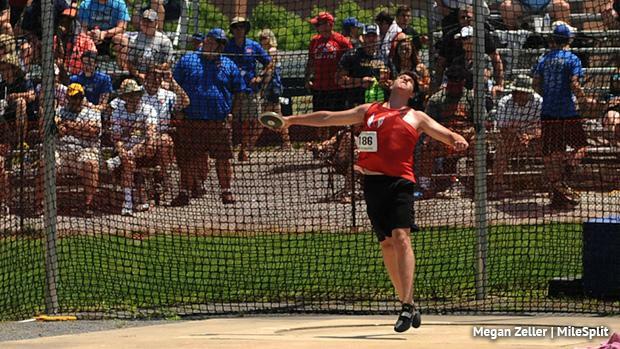 A pair of boys return this season with best throws over 160 feet from a year ago. Berks Catholic's Brandon George threw a best of 164-4, while Hickory's Brock Grundy comes in with a best last year of 163-8. Grundy comes in as the defending state champ in AA. He threw 163-4, just off his PR, to take the win at Shippensburg. After a solid winter in the shot (he earned the indoor state title), look for another big spring out of Grundy in the throws, where he'll look to add more state gold. There are four other returning state medalists in AA back this season. Lakeland's CJ Dippre (159-9 best) took third at states last year as a freshman. Now a sophomore, he'll be in search of even more in the event. Moniteau's James Parenti (158-0 best) was fourth at states last season, while Chestnut Ridge's Duane Knisley (159-10 best) took fifth. Those boys will all give Grundy a run for his money in what will be a very competitive AA discus this season. Kane Area's Bailey Blint is another returning medalist in AA; he was eighth last season. Corry Area's Jacob Nelson and Quaker Valley's Dom Lagnese will also be among the boys to keep an eye on this season in the disc. No AAA state medalists are back this season. George ND'd at states and the rest of the podium was all now-graduated seniors a year ago. George is the reigning District 3 champion and will certainly be a factor again. Thomas Kitchell of Notre Dame-Green Pond threw a best of 154-11 last season, and he started his outdoor season early this year, already launching a current PA#1 and PR of 160-4 at a meet in North Carolina. Hunter Linhart of Plum is the top returner based on states finish in AAA. He tossed a best of 147-7 at Ship to take tenth a year ago. Joining George and Kitchell in the 150+ club last year were Somerset Area's Nick Hyde, Saint Marys Area's Adam Park, Fleetwood Area's Jeff Kline, and Owen J. Roberts' Aidan Hayward. Overall, it should be a close and interesting battle for the top spot in AAA this spring. In the PAISAA, Olatide Abinusawa of Germantown Academy has the best returning throw at 145-11.